Not a salt thread, just making a joke on the current meta. 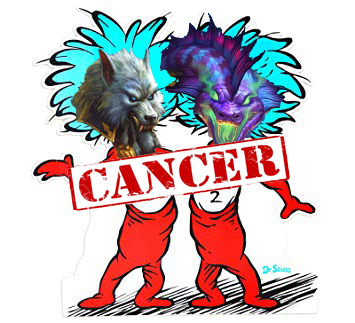 Hopefully there's something that counters Cancer 1 and Cancer 2 in the next expansion. That made me laugh a fair bit. Usually my favourite class is Warlock, but since I hate even warlock I go for good ol' SMOrc (8 wins until golden SMOrc btw). There is such thing as my favourite class, there used to be my favourite decks though. I like shaman, but clearly blizzard does not. i like lock so much! pls, help with my deck! But I do have anew absolutely favourite one to play against: Druid. The only druid deck you ever see now really is Meca'thun. There were dark whispers of a weird Hakkar deck, but they were laughed off as being pure comedy. Meca'Druid is an automatic win for me. And you can make the satisfaction last. Wait for the very last turn before the druid wins. Warrior. Any variety and flavour. Rush, SMORc, Control, Recruit, Pirate Scum, literally anything. Thief Rogue. Its always a different game which is fun and fresh. Also it's a very "snowball"y deck - if you can build up speed and not get SMOrc'ed before you get some good steals in it can very difficult for an opponent to turn the tide. I've always loved hunter, but it's only good for the meta if it remains in tier 2. Tier 1 hunter is utter cancer (also, Rexxar needs to be nerfed regardless of if it's before or after rotation. i love the card, but it's broken and wholly unfair). I don't have any secondary favorite classes, just archetypes in different classes. theoretically priest is my favorite class but it's so handcuffed to otk trash right now that I find it boring and unfun. Rogue is currently taking my top spot.